The plants absorb nutrients by the roots in the soil for their nourishment. The nutrients and water, sugar substances are transported from the roots to all the parts of the plant by the tissues called xylem and phloem. 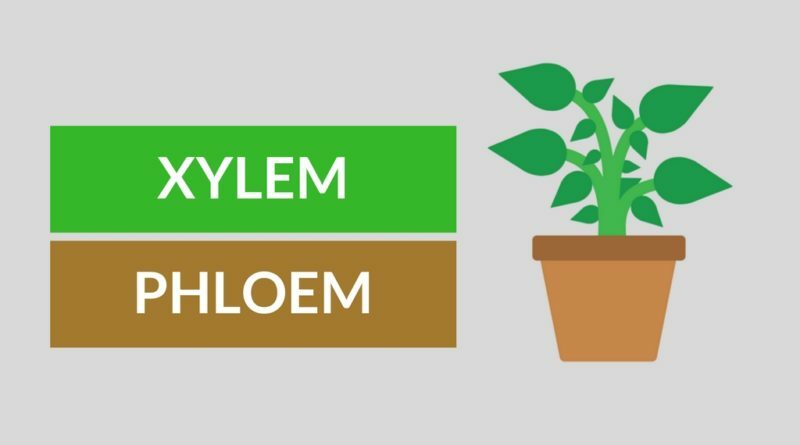 there exists many differences between xylem and phloem, some of them are discussed in this article in a detailed way. xylem is defined as the vascular tissue present in the plants, which transports water and other dissolved nutrients from the root to the other aerial parts of the plant body to help in the nourishment process of the plant. phloem is defined as the vascular tissue present in the plants which transports sugars that are synthesised in the green parts of the plant body to all the parts of the plant to eat in the nourishment of the plant. Xylem transports water and minerals from the roots to aerial parts of the plant. Phloem transports sugars that are synthesized in the green parts of the plant to the other parts. Xylem occupies the center of the vascular bundle. Phloem occupies outer side of the vascular bundle. Xylem vessels are made up of lignin and Cellulose. Phloem is composed of five types of cells. Xylem comprises of fiber, xylem vessels and tracheids. Phloem comprises of sieve cells, sieve tubes, companion cells, Phloem fibers and phloem parenchyma. Xylem helps the plants by giving mechanical strength to the plants. Phloem won't give any mechanical strength to the plants. Xylem and Phloem are the parts of the vascular bundle. Vascular bundles are defined as the strands of conducting vessels having xylem and Phloem to supply water from roots and food prepared by leaves to the remaining parts of the plant.